The very next night after seeing Nevada Barr and Keith McCafferty, Denis and I jumped back in the Jeep and headed to The Poisoned Pen. This time we were going to see Anne Perry, author of the Christmas mysteries as well as series featuring Thomas and Charlotte Pitt, William Monk, and Matthew Reavley. It's hard for me to believe that I've been reading her books since 1979! One thing to be said for Denis, he doesn't particularly care if he's heard of the author or not, he likes to attend these events with me and often comes home to order audiobooks from that evening's author. It's a good thing we tend to arrive early because it was a capacity crowd. Little did we know that we were both in for surprises when Barbara Peters arrived. Denis was in shock when The Poisoned Pen's owner Barbara Peters winked at him as she got things ready for the interview. Since she had a few minutes before the official start of the event, she began to fill us in on things to look forward to in coming weeks. She'd just finalized Michael Connelly's next appearance at the Arizona Biltmore. (Mark your calendars for Monday, November 3.) Remarking that it was rather odd for the release date to be a Monday (crime fiction publishers tend to prefer Tuesdays for some reason), she shrugged and then went on to tell us that there would be a twenty-fifth birthday party for the bookstore out in the parking lot, more details to follow at a later date. Then she looked over at me and said, "Are you writing all this down so you can put it on your blog?" Stunned, I did manage to nod my head in a timely manner (although I forgot what I was scribbling down and had to regroup)! 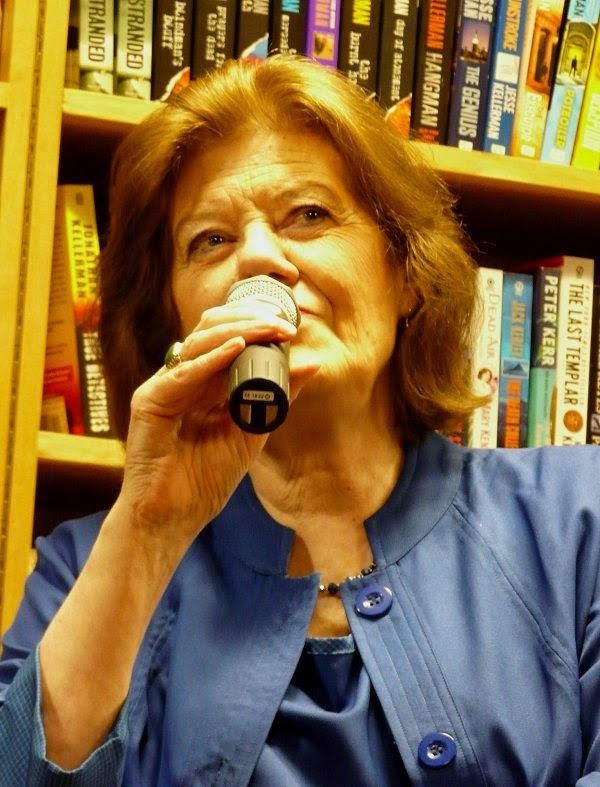 Then it was time to introduce Anne Perry. Since she's going to be living in Los Angeles part of the year, Barbara was happy to say that we should be seeing her more often, and rest assured that brought on a round of applause. There was a quick segue into pets in books which led Perry to say that she was once told, "You can't kill the dog; you won't sell your next book!" The very next topic was Anne's DVD entitled "Put Your Heart on the Page: An Introduction to Writing" which is aimed at the aspiring writer. The DVD is currently available in the UK through her website, and will also be available in the US and Canada later this year through Dreamscape. "It's about one hour long, and it's good because it's not just me in front of the camera," Perry said. Peters commended her for fostering beginning writers and mentioned that the Phoenix area now has three local writers who are published by the major houses. 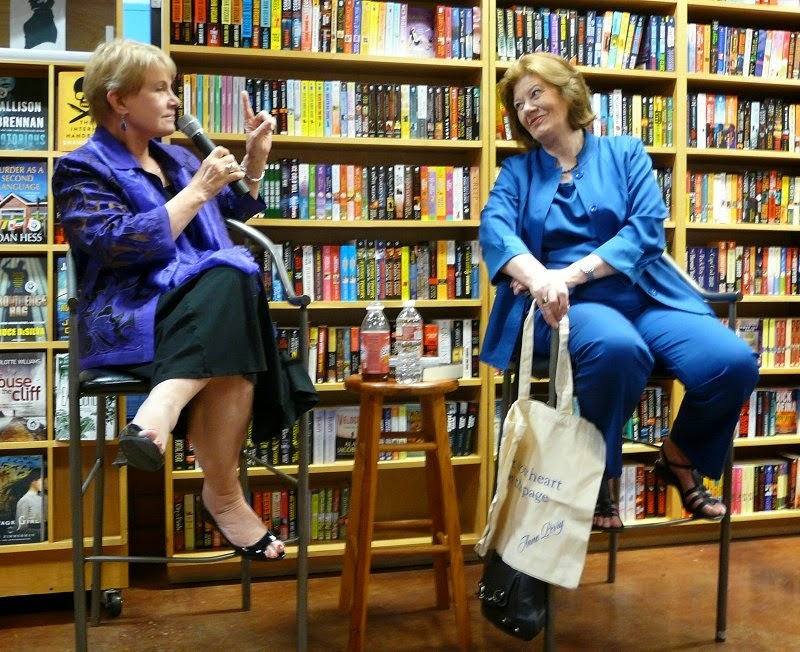 "I would love to foster some sort of workshops for writers," Barbara said. "...always make your main character uncomfortable." "I was once given the advice that I should always make my main character uncomfortable," Perry told us. "Having Thomas Pitt working Special Branch and making decisions of life and death make him very uncomfortable. Also, when he's dealing with things like treason, he cannot discuss any of it with his wife, Charlotte." "It certainly brings a new dynamic to the relationships between Thomas, Charlotte, Charlotte's sister Emily, and Aunt Vespasia," Peters agreed. Perry then made us all laugh by inadvertently letting slip a character's marriage in a future book. I'm going to be mean and not divulge anything! Barbara told us that she loves Aunt Vespasia, and many heads in the audience nodded in agreement. "Aunt Vespasia knows everyone, talks to everyone, and goes everywhere. It can be much easier for her than it can be for Charlotte." She then looked at Anne and asked, "Since Pitt can't share his work with Charlotte as he used to, does this mean that Charlotte and Emily will be doing other things? Emily's husband Jack is now a member of the House of Lords...."
"That's a possibility," Perry said with an enigmatic smile and then immediately clued us in on a bit of typical British political shenanigans. Many politicians who are caught behaving badly have been given a peerage and a seat in the House of Lords. Soon after, many of the aforementioned simply disappear from the public eye, and most people don't mind a bit. With a perfectly raised eyebrow, Perry looked out at us and said, "Remember, just because you got caught behaving badly doesn't mean you're bad. It just means you got caught!" Another laugh came when Perry admitted that she was running out of streets, avenues, roads, etc. to name her books. Many of Anne Perry's fans probably already know that her book titles aren't always the same on both sides of the Atlantic. Sometimes her UK publisher... or her US publisher... wants to change the title. During one of the more recent times when Perry was contacted about a title change, she told her UK publisher, "Do what you want and let the Americans do what they want because that's what I want them to do!" Yes indeed, those book titles can be a problem. Her next Christmas mystery is a case in point. Her UK publishers have refused her choice-- A Christmas Voyage-- and are leaning toward calling the book A Christmas Wedding. Perry has turned that down for a very simple reason: "There's no wedding in it!" There's a slight chance that the book will be called A New York Christmas, but don't bet the farm on it! There was a similar problem for one of Perry's William Monk mysteries. In the US, the book is titled Slaves of Obsession, but her UK publishers were horrified: "There's a line of erotica with that name. We can't have that!" Therefore, in the UK, the book is titled Slaves and Obsessions-- and now you know the reason why. 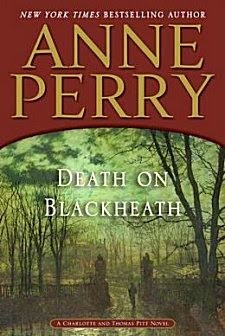 Talk turned to the latest Pitt book, Death on Blackheath, which takes place in 1898. Barbara Peters told Perry, "I couldn't figure out how you were going to resolve it," to which Perry replied, "Good! If I can fool you, I can fool anyone!" Peters said, "It's a bit of a case of is there a crime or isn't there." Thomas Pitt has been called in to investigate the case of a maid who's disappeared because the missing woman works for a marine engineer who's very much involved with the building of an early submarine. "We're beginning to hear a bit of the guns of August starting to rumble," Barbara remarked. "You're writing towards your World War I novels." Perry agreed. "We seem to get wound up when the spring's about to go at the end of each century. For example, in 1492 there was the expulsion of the Jews from Spain, and in the 1790s there was the French Revolution." Barbara Peters then mentioned that moving another character, William Monk, to the Thames River Police was perfect. "It reminds me of the Lacey Flint series that S.J. Bolton writes because the Thames figures so strongly in those books, too. Are any of you familiar with them?" At least one head nodded in response to that question-- mine. Anne looked at us all and asked, "Is there anything more sinister than rotting wood and dripping water?" The next William Monk book will be released at the beginning of September and is titled Blood on the Water. Perry's current work-in-progress is called Corridors of the Night. One of the fans in the audience asked Perry if she'd ever had any adverse reactions to the characters in her books. She had, mentioning a fan who'd accused her of being anti-Semitic. "If she'd been paying attention," Anne said, "she would have noticed that it was a particular character who was anti-Semitic, and he came to a very bad end as a result!" Another person asked if William Monk and Thomas Pitt were ever going to meet. "It would be terribly difficult," Perry said, "since there is a span of thirty years between the series." Barbara Peters added, "It would be fun, though, to have a young Vespasia meet Monk!" Perry considered it for a moment and said, "That would be a possibility!" Anne then divulged that she's currently working on something about the 1930s that may have to be two or three books. They will take place during the years Hitler came to power (and when Vesuvius erupted in 1933) through to Kristallnacht in 1935. "When you're writing about Victorian England, you read and look at pictures and photographs to do your research. When you're writing something that takes place on the coast of Almalfi, you go there. Often." When the laughter died down, another fan asked Perry about Hester Latterly, who's William Monk's mainstay in that series. As it turns out, Anne Perry is a Hester Latterly wannabe. "Monk needs a woman who can stand up to him. I wish I could be as strong and as brave as she. Hester says things that I would love to say." "Your characters tend to get married," Peters observed. Perry smiled and said, "I'm a bit of a softie. I like romance." 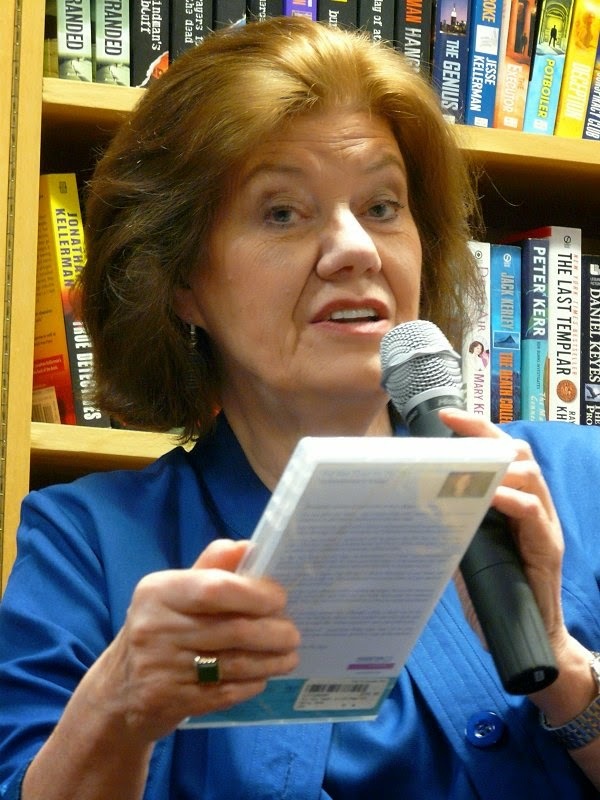 The next several months are going to be very busy for Anne Perry. "In the next ten months, I have three books to complete, and within the next year, I have to plan three more books. I have rough outlines for the three I'm planning, but I don't even really have ideas yet!" "You will have," Barbara assured her. Another fan question concerned the number of employees Perry has. "I have a part-time secretary who does the typing. I have a part-time researcher. I have an agent who's not really my employee but worth every cent. I also have a publicist in the US, but I don't need one in the UK." Another fan loves Perry's book covers. "Most of the covers are existing paintings that need releases before they can be used as covers," Anne said. "The first story I ever sold..."
An extremely enjoyable evening ended with Perry telling us about the first story she ever sold. "I was five years old, I think, wearing a pink dress that my mother had done smocking on and in my Mary Jane shoes. I'd been given sixpence, and I was walking down to the shops to buy candy. All of a sudden, a big bully with a stick planted himself in front of me and demanded, 'Gimme yer sixpence!' I spun him such a tale of how poor my family was and how we didn't have any food and that I needed that sixpence because of my sick baby brother. That bully wound up giving me a half crown!" I think it's safe to say that that incident proved she was an internationally bestselling author in the making. 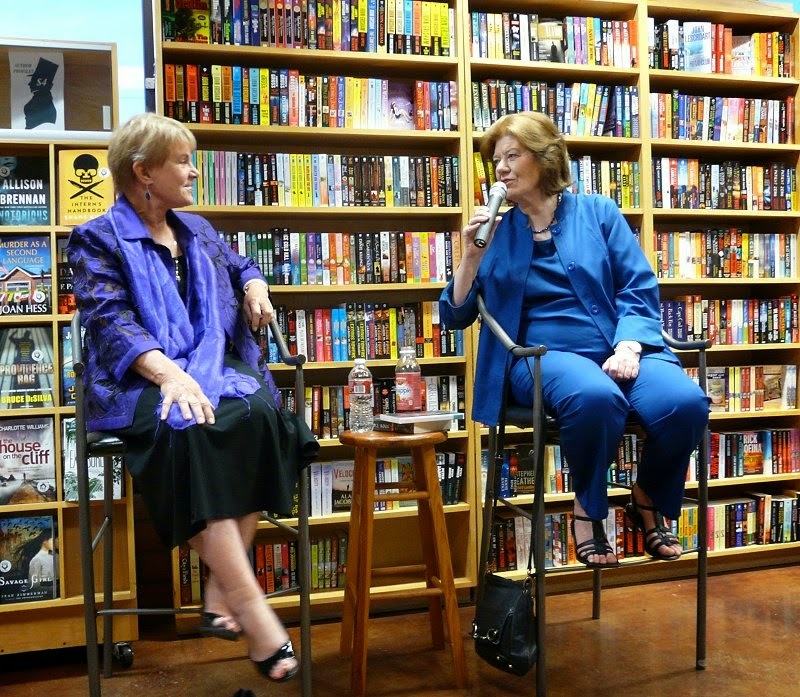 I know I wasn't the only person that evening who was glad Anne Perry will be coming to The Poisoned Pen more often. She's a delight! What fun! So many fantastic events at the PP. Did you both leave with books or audiobooks purchased? How lucky to live near such a great bookstore (sigh). I think Denis does get extra enjoyment from an event when it's a British author. I know that I do. Although he's had questions for authors in the past, he didn't have any for Perry-- probably because he's never read any of her books. I seem to remember walking out of the store with my usual purchase! I think to be anywhere near Barbara Peters, the grande dame herself, would be a treat. She seems to be the kind of person who generates action, fun, educational experiences, just a powerhouse with a great sense of humor and style. 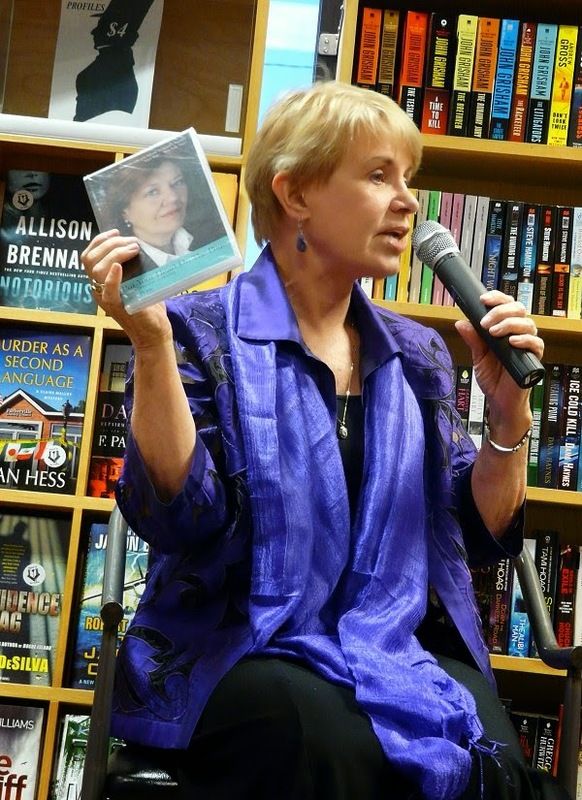 Plus she not only owns a bookstore, with a lot of programs, but she publishes books, too. There are two people whose lives I would want to emulate if I woke up at the beginning of a Do-Over: Sir David Attenborough because of my deep and abiding love of nature and travel; and Barbara Peters because of my deep and abiding love of books, reading, and travel. 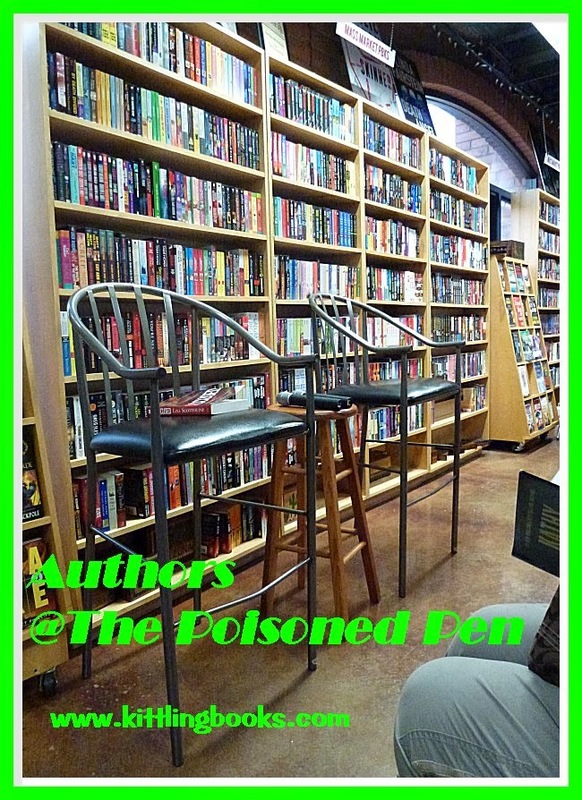 Any time I go to an event at The Poisoned Pen and learn that she's not the one sitting up front with the author, I pout a little.